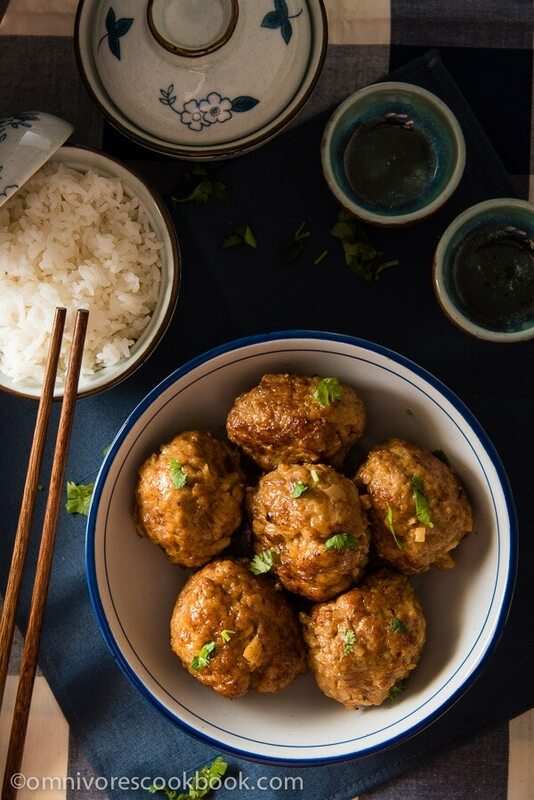 Enjoy the classic Chinese pork meatballs in a healthier way, without compromising on flavor. 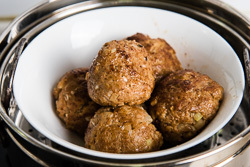 Chinese pork meatballs are also called lion’s head (狮子头, shi zi tou). They feature tender, moist, and light meatballs with a savory taste. 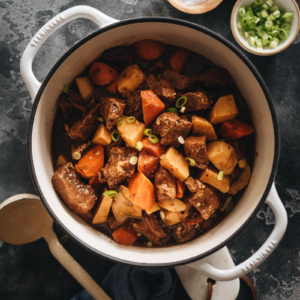 This dish is a staple food for my family, because it’s quite easy to cook in big batches and is so comforting to enjoy any time. Eating the savory meatballs with rice is as addictive as eating a burger. Juicy and flavorful meat and starch are the best combo in the world. You’ll find quite a few versions of Lion’s Head in China. One popular rendition in northern China is braised meatballs. The cooking method for those is quite close to the one in this recipe. 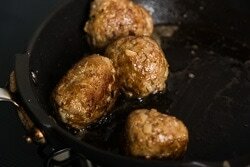 But instead of steaming, those meatballs are braised in a soy-sauce-based liquid after browning. 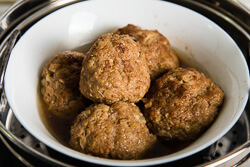 Another type is meatballs cooked in chicken broth. They’re usually served by themselves instead of over rice. Today I’ll introduce a third type – steamed lion’s head. This recipe was passed down from my grandma. She used to make a huge batch of these every two weeks. After cooking them, she’d reserve a small amount to serve to guests who might be visiting her house. She would freeze the rest and give them away to family members, including my parents. These meatballs are my favorite and are even better than the ones from the restaurant. They are extremely fluffy and moist and are as tender as the pork in a slow-cooked Bolognese sauce. The truth is, you will need to add so many breadcrumbs and chestnuts, that the size of the patty doubles. The water chestnuts add a really refreshing and crisp mouthfeel, so the meatballs will taste extra light. My mom once told me, making the meatballs tender was not the original intention of adding so many other ingredients to the pork. It’s because pork was in short supply when she was a kid, so her parents needed to find a way to make these meatballs more filling with limited ingredients. Thus, the moist and tender texture of the meatballs was just a nice side effect of living poor. Even now, my family still enjoys cooking with this recipe. It tastes like home. I really love this steamed version myself. Besides its superior taste and texture, it’s also a lot healthier than the average meatball. By browning and steaming the meatballs, a lot of fat is rendered out, so the finished dish will end up with fewer calories. The recipe may seem a bit time consuming, but it’s actually very easy to prepare. The active cooking time in the kitchen is only 30 minutes. The meatballs are one of my favorite lunch items, too. They freeze well and taste as great after reheating. Stuff one of these into your lunchbox with steamed rice and some greens, and you’ll make all of your colleagues jealous when you heat it up in the office microwave. You can also serve the meatballs for dinner as a main, pairing it with fast and easy sides such as cucumber salad, okra stir-fry, or spinach salad. If you like this recipe, also check out the Mom’s best series, which includes a delicious list of recipes that handed down from my grandma. 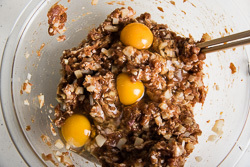 Add ground pork into a large bowl. Add 4 tablespoons water. Mix well with a spatula until water is fully incorporated. 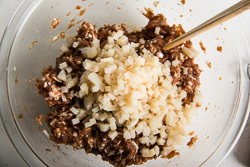 Add Shaoxing wine, light soy sauce, dark soy sauce, salt, sugar, grated ginger, cornstarch, and scallion. Mix well. Add chestnuts and eggs. Mix a few times. Add panko. Mix well. 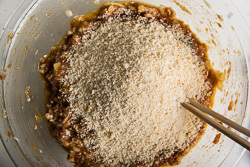 Add sesame oil, mix until it forms a soft paste. Heat peanut oil in a nonstick skillet over medium heat until warm. 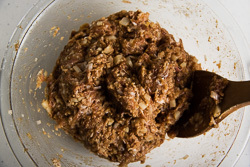 Use bare hands to scoop about 1/3 cup of the paste and shape it into a meatball (*see footnote 1). The meatball should be a bit runny, barely able to hold its shape (so the finished meatballs will be tender and juicy). If the meatballs cannot hold their shape, add a bit more panko and mix again. If the meatballs are still a bit tough, blend in more water and mix well, 1 tablespoon at a time, until the paste turns soft. 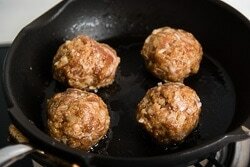 Carefully place 3 to 4 meatballs in the skillet and make sure to leave enough space to flip them. When the bottom side is just set, carefully roll the ball with a spatula to cook the other sides. Continue to do this until all sides are set and browned (*see footnote 2). Transfer to a plate. Continue to brown the rest of the meatballs. Heat the steamer over medium high heat, covered, until the water begins to boil. Turn to medium heat. Cook covered until the meatballs are cooked through, in 40 minutes. Cook the second batch by using the same method. After cooking the first batch, check the water level and add more if it runs too low. 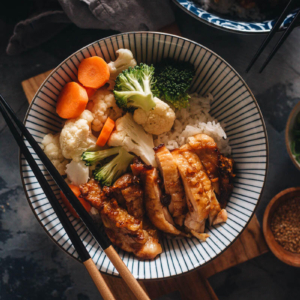 Serve warm over steamed rice as a main. Store the meatballs in an airtight container in the fridge for 3 days or in the freezer for up to 2 months. After steaming, the meatballs will render some fat and liquid. Drizzle it on the meatballs before storage, to keep the them tender and moist. The best way to reheat the meatballs is by steaming, the same method used to cook them. The meatballs will be heat up evenly and still be moist inside. Alternatively, you can use the microwave. Make sure the container has some liquid (leftover grease or 1 teaspoon water) inside. Please a loose lid on top and heat it up in the microwave. This is a bit messy, but I find using bare hands to shape the meatballs is easier than doing so when wearing plastic gloves. It can be difficult to keep the meatballs in shape, because the meat mixture is quite runny. You need to handle them gently, so the balls won’t break apart. You can cook the top and bottom sides first, like cooking a very thick burger patty. Then you can use two spatulas to let the meatball stand, to cook the edges. The meatballs won’t look very pretty, but will still taste great. Unless you are using a very big pot, you’ll probably need to cook the meatballs in two batches. It’s fine to stack the meatballs. Wow! These look amazing…I have some ground pork in the freezer and this is what I’m going to do with it! These lion’s head looks amazingly delicious! It is a great idea to do a steam version. Much healthier! I will need a big bowl of rice to go along with them. Thank you for sharing your grandma’s recipe! The family’s recipes are the best treasure. They have the comforting flavors that we are always looking for and going back to. I got to try this for sure! The Shaoxing wine is all I’m missing, and the big Spec’s on mopac (omg you’re moving to Austin! So am I! We just signed everything for our very first house, so no more boonyland living for a while, though finding just the right things may still rely on the almighty Amazon sometimes) might be able to order me some if they don’t have it stocked already. TheHubs loves pork so this should please everybody. It is! All of those things. I love the name of these meatballs. I”m always looking for new recipes and your sounds so flavorful I have to give this a try. These meatballs sound wonderful. And I’m delighted to know that your visa was approved, and I hope your move to Austin goes smoothly. I’d love to make these, Maggie, but I don’t cook wiht pork. What other ground meat would you substitute, turkey, maybe? Also, thanks for showing Nagi how to hide collage pins. That’s how I discovered your great blog, too. Hello, I know this is a thread from a few years ago but here’s my experience in case people still have the same question. I made them with ground turkey and I’m not sure how true to the recipe they were but they were delicious! I followed pretty much everything else except I used white vermouth instead of the cooking sake. I just happened upon this blog and I’m so glad I did! Thank you! Hi Katie, thanks so much for letting me know that the recipe works with ground turkey as well! I’m pretty sure those turkey meatballs you made were delicious 🙂 I will try it again the next time. We are trying to lose some weight lately, so we’d always prefer leaner meat. These are my favourite – and your recipe sounds exactly like the ones I order. 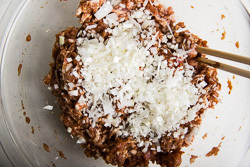 Meltingly soft meatballs that somehow hold their shape. Yummo! Hi, Maggie, I’m going to try these tomorrow using ground beef and ground veal, 50-50,, and I’ll report back. I was wondering if you’d ever tried browning them in the oven on broil or at 450 F, perhaps, instead of doing them on the stovetop. I was thinking the meatballs might hold together more easily for the transfer stage. 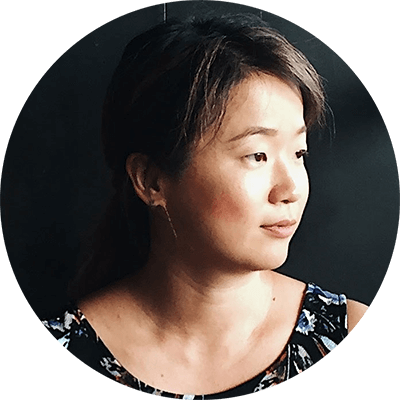 Reporting back, Maggie: I made them with a 50-50 mix of ground beef and veal, using two eggs and ginger-infused dry sherry instead of the Shaoxing wine. I made them smaller, using about 1/4 cup of he meat mixture or less, for 16 meatballs. Although they were a bit time-consuming, the results were outstanding. My husband, whose nickname is Mr. Fussy, said this was definitely a recipe to make again. I served them with sesame noodles. Thanks for a wonderful recipe! So glad you and your husband love this dish. Have a great week ahead! I browned them on the stove as the recipe says. And thank you for including storing and reheating directions. We had them again tonight and they steamed perfectly. Next time I’ll make more because they freeze so well. And I will see if the right kind of ground turkey might work..
Hi Marlene, thanks for leaving a comment and let me know! Yes they freeze very well. That’s why I always make a big batch and save them for later. I believe ground turkey will work if you get the one that contains 15% fat. I tried it the other day with a slightly different recipe, the meatballs turned out very tender and nice. OMGoodness!!! It’s delicious, tender and moist! I added napa cabbage on the bottom of the meatballs before steaming it. Served it with steamed rice!!! YUMMIE!!! So glad to hear you cooked many of my dishes and enjoyed the result. You just made my day Cathleen! Hi Stephen, I never used the salty Shaoxing wine, so it’s really difficult for me to tell. I think you can try slightly reduce soy sauce. I won’t suggest omitting it because it adds nice flavor. Even if the meatballs turn out a bit salty, you can always serve them with a bit more rice. Hi Maggie! Yours recipes are excellent. Can you suggest substitutes for water chestnuts? There is no perfect substitutes because water chestnuts add a nice crispy texture that make the meatballs light. I’d suggest diced white onions if you don’t have water chestnuts. They do turn soft after cooking. The result won’t be the same, but should still be tasty. Hi Maggie, I came across your blog while searching for meatball recipe. Yours look very delicious, will try it soon. Do you have any recipe on pairing the meatball with some kind of sauce? Hi Anita, sorry I do not have a sauce recipe that goes with this dish. We usually season the meatballs with plenty of spices so they will be flavorful enough to serve by themselves. If you’d like to serve it with sauce, I think a yogurt based sauce (such as tzatziki) should go these meatballs. eep… just tried the recipe and the flavor was good but it’s wayyyyy too salty for my taste. even paired with rice and veggies still salty I would cut the salt by 1/3 next time and just keep the soy. four tablespoons of soy is already pretty sodium heavy. I’m sorry to hear it! Did you use a salted Shaoxing wine? This recipe uses a lot of wine and it might cause the problem (I was using a Shaoxing wine that does not contain salt). Also, there is only 1 teaspoon dark soy sauce. It is less powerful than light soy sauce. So if you’re using 4 tablespoons, it will increase the salt level. Anyhow, I hope they will turn out tastier the next time. 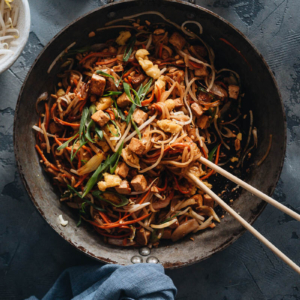 Just tried this recipe and oh my goodness! So flavoursome, delicious and moist just as you described. We also just as an accidental happinstance – tried them with tzaziki and they tasted amazing. Can I cook it in an oven instead of skillet, its oily and messy? Thank you for the recipe. Hi Kathryn, I’ve never tried to make these meatballs in the oven but I think it should work. The meat patty in this recipe is quite tender. The meatballs won’t stay in perfect shape but it won’t affect the taste. Thank you Maggie. I finally bought water chestnuts this morning, ready to make it today. Oh wow! Maggie! This was absolutely mouth-watering. I missed the sesame oil, overbrowned the balls and had to braise them quickly with cabbage cos of time constraints. But, just WOW! I can’t wait for the weekend to make it the way you did. Thanks for the great recipe! Hi Amanda, I’m so glad to hear you tried my recipe and enjoyed the dish! Braising these meatballs totally make sense and I believe they turned out delicious. I can’t wait to hear your feedback on the steamed version! Maggie, the Lion’s Head Meatballs that I first learned how to make some 40 years ago were about 70% ground pork and 30% crabmeat with crab coral added as well. And ginger, etc etc. I am wondering, is this a regular version of this dish? Have you ever heard of Lion’s Head Meatballs made with crab?? Perhaps it is a version from a seaside area?? Anyway, I highly recommend this version. Using homemade chicken broth and simmering the Meatballs for about 30 minutes makes a wonderful broth full ofmpork and crab goodness. I love northern too! Good to know! I love Lion’s Head Meatballs! I will try this. Hi Maggie! This recipe sounds amazing but I don’t have a steamer. 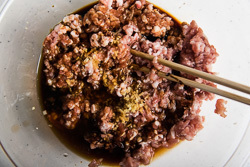 Do you have any ideas on the process of braising the meatballs in soy sauce? Amazing recipe Maggie! Thank you so much for sharing your family’s tradition with us. I made these for dinner tonight and I couldn’t be more pleased. I subbed Sherry for the Saki (I live in the middle of nowhereville) and they were still great. Such a tender, moist meatball – I’ll be making these again and again! Can’t wait to share this with friends! I don’t think it should use so much salt. 3 tsp of salt for 1 pound of pork is too much. Hi Richard, this dish is on the salty side because we usually serve it with rice. 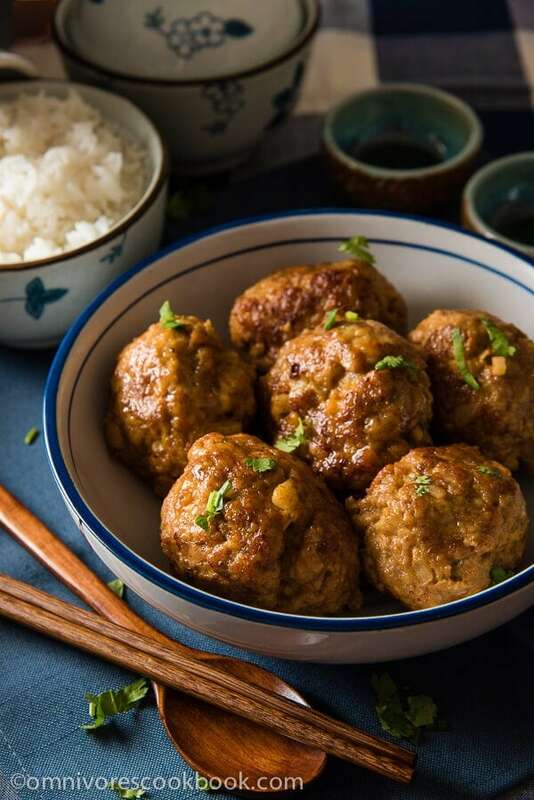 Unlike western style meatballs, we do not serve it with any sauce, so the meatballs have to be a bit salty so it tastes just right with the rice. Plus the water chestnuts and breadcrumbs will add quite a bit volume. That’s being said, I think you can reduce the salt to 2 teaspoons without any problem. hello, I’m throwing a Chinese new year party for 8 friends. Should I double this recipe? Also, I don’t have a steamer, but I like the idea of steaming because I want them to stay tender and moist. What do you recommend I do, try or buy. I made your version of Lion’s Head for my family’s Chinese New Year dinner last night and it was very good. The meat mixture was quite liquidy, as you describe in the recipe, so I used a one-third cup measure to drop mounds of meat into the hot oil in my pan. This “technique” worked beautifully. Once the mounds began to brown, it was easy to turn them over to brown all sides and they held together. The meatballs were fluffy and delicious! One more thing (and to answer Shellie’s question): using a one-third cup measure, this recipe made 13 meatballs. How do you know when the meatballs are cooked through? I’ve been steaming them for a while now (around 40 mins) but the meat still looks a bit pinkish/translucent. Love your recipes! I’m going to give this lion’s head recipe a try today! Thank you for sharing all these wonderful recipes with us. So the water chestnuts need to be fresh or canned? Hi Zhen – Maggie’s husband here. We made these with canned (drained) water chestnuts. They should also be great with fresh ones, if you’re lucky enough to have access to them 🙂 Good luck and happy cooking! AMAZING!! These were So full of flavor and even the pick kids loved them! Thanks so much for sharing your grandmas recipe ? I made these last night, froze the majority in 4 ball plastic packs. How do I reheat these, should I steam them over bok choy for 40 minutes straight from frozen, or do I have to thaw them first? Thanks. I steamed from frozen and they turned out great! My Mom used to make these. Thank you for this recipe. Great memories and the dish came out perfect. Hi Maggie! I was wondering if I could use an Instant Pot to steam the meatballs, and for how long you’d recommend steaming for. Thank you! I’ve been using recipes for ages and I’m so excited to try these 狮子头 this week! I’ve never used Instant Pot to steam these but I think it should totally work. With high pressure, you should able to get them down in 20 to 25 minutes. These look delicious and I like the steaming method vs. frying. Will these hold up in a broth? Hi Elizabeth, I’ve never tried cooking them in a broth but I think it should work as long as you brown them well, and don’t stir too much when adding to the broth. Hi Maggie, I’ve made these twice now and they’re great! 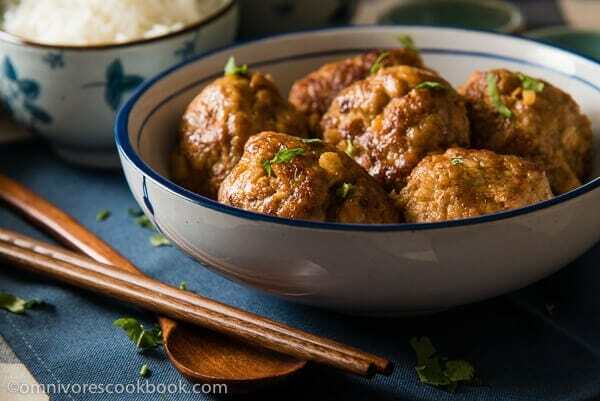 I’ve been looking at the pearl rice meatballs, too – do you think I could use this filling, roll it in soaked glutinous rice, and steam to cook? Or would it fall apart because it wasn’t browned first? LOVE YOUR RECIPES. Thanks! Hi Amie, I’m glad to hear you like the recipe! Re your question – I’ve never tried to steam these meatballs without browning but I imagine it might collapse or fall apart because the mixture is quite runny. 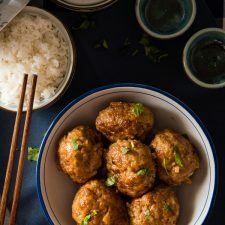 The pearl rice meatball recipe uses a much firm mixture so you can actually roll the meatballs with rice. Made these again tonight for the second time. It’s one of my favorite recipes… so far. Looking forward to trying new and more!Thank you for this!